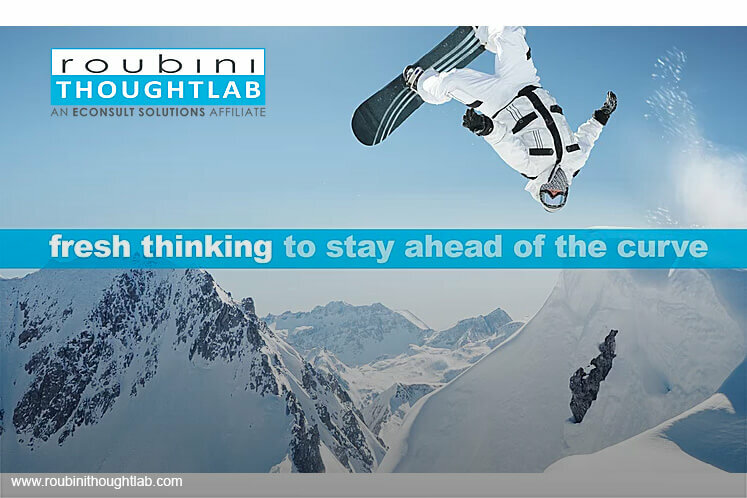 Asset management firms will have to lower their investment fees and enhance their digital capabilities to survive in a more competitive market, says Roubini Thoughtlab CEO Louis Celli. He says this trend is being observed globally, including Malaysia. Asset management firms that lag behind the trend will lose out to their competitors, or even financial technology (fintech) firms. “In general, investors in Malaysia and around the world want digital access and lower investment fees. It is always a bad idea to fail to move with the customer. Institutions that move too slowly will be replaced by fintech firms and other competitors that move more swiftly,” he tells Personal Wealth. One of these examples of combining low investment fees with digital capabilities, Celli says, are robo-advisers. Robo-advisers are online platforms that provide investors with financial advice and portfolio management services, which require minimal or no human interaction. Most of these platforms help investors invest in exchange-traded funds globally, based on their risk aversion level and investment horizon, which is in turn decided by a computer algorithm that makes its evaluation according to investors’ response to questionnaire. Their investment fees generally range from 0.25% to 0.8%. In line with the trend, he says traditional investment instruments, such as unit trust funds, have to follow suit to lower their fees sooner or later. For now, the sales charges of Malaysian actively-managed unit trust funds, ranging from 3% to 6%, are too high. “Those rates are very high compared with other markets around the world. I do not know the intricacies of Malaysian law, but I’m sure that investors can access investment opportunities outside of the country with much lower fees,” he adds. Celli is the co-author of Roubini Thoughtlab’s wealth industry report, titled Wealth and Asset Management 2021: Preparing for Transformative Change. The report, published last month, is based on quantitative analysis of 2,000 investors and 500 wealth firms across 10 world markets. It is also based on economic modelling and forecasting across 25 countries. The report notes that regulatory changes will put further pressure on fees, which is an ongoing trend in recent years. According to the report, this trend is happening especially in the US, Canada, the UK and European Union, which are developed countries moving ahead of the curve in terms of financial regulations. “The list of recent regulatory major changes is long and varied, but the direction is clear: Wealth managers will be increasingly discouraged from receiving commission when their clients purchase investment products, and they will face rigorous requirements to provide independent advice in the best interest of clients. This point is supported by Rodolfo Castilla, global head of wealth management products and platforms at Citi Consumer Bank. Adding on to the report, Celli says investor’s best interest will be better safeguarded in the future and it is a trend that regulators globally, including Malaysia, will continue to pursue. “Since the financial meltdown, regulators have tightened controls on investment and financial institutions to protect the public. Consumer protection laws include transparency on fees to ensure that advisers always act in the investors’ best interest, and not only to push products. “The Wells Fargo debacle is a good example of salespeople pushing products that might not be in the best interest of their clients,” he adds. Wells Fargo & Company is a US international banking and financial services holding company that is based in San Francisco, California. Last year, the employees of the bank were found to have fraudulently signed up customers for deposit and credit card accounts to hit sales targets and receive bonuses. As a result, the regulators have fined the company US$185 million. Celli says, according to the report, asset management firms in the emerging markets will have to move fast enough and adapt to these changes in order to stand out in the market race. This is because 65% of emerging markets’ investors are willing to change service providers if the latter fail to meet their rising expectations. The key segments that are “most apt to jump ship” include millennials and women. Celli says there are many ways investors can switch service providers. “For example, they may decide to concentrate more of their financial portfolios on one bank over another to gain access to better or wider investment services, or to reduce fees or take advantage of financial incentives. They may also shift from active to passive funds, or from wealth advisers to mutual fund companies and fintech firms in order to reduce cost. He says investors are jumping ship more frequently in emerging markets because investors in these markets have not established long enough relationships with their service providers, compared with those in the developed markets. The report notes that asset management firms have not been sitting idle in facing these challenges. Besides issues surrounding investment fees and digital capabilities, these firms have been anticipating investors’ behavioural shifts to cater for their demands. 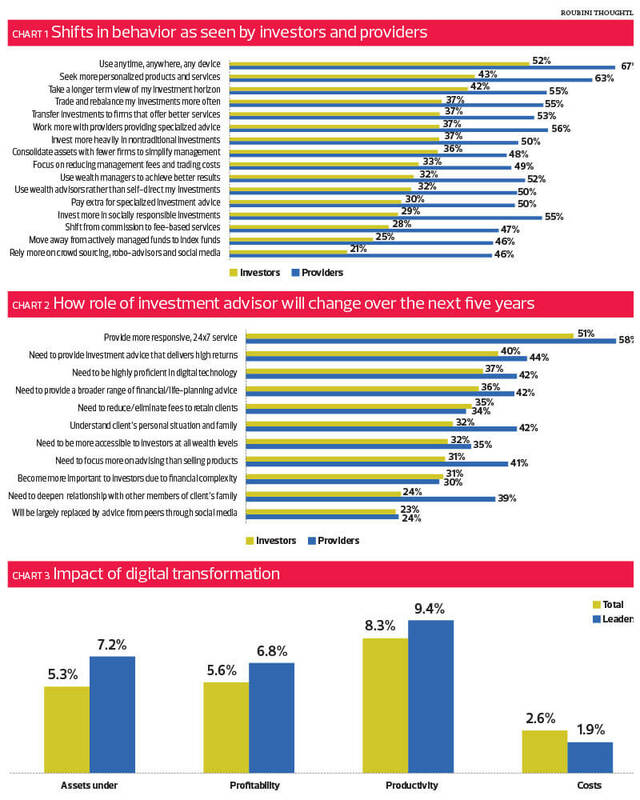 Roubini Thoughtlab’s survey shows that “investment providers are fully aware of the future shifts in investor behaviours, but may be overestimating the pace of change over the next five years”. For instance, more than half of the service providers (55%) see a shift of investors to socially responsible investments, compared with less than a quarter (29%) of investors. Almost half of the providers (46%) see a shift towards those who would rely more on crowd sourcing, robo-advisers and social media, compared with only 21% from investors. A similar percentage (47%) of providers expect the shift from commission to fee-based services compared with 25% from investors. The shift towards consolidation of assets with fewer firms to simplify management is aligned with the expectations of service providers and investors. There are 48% of service providers that see such a demand as compared with 36% from investors. This is followed by the shift towards those who are taking a longer-term view of investment horizon (55% from service providers and 42% from investors) and those who invest more heavily in non-traditional investments (50% from service providers and 37% from investors). Moving forward, the report says the ­incumbents (existing asset management firms that have established their position in the market) will most likely turn out to become the winners in the fast-changing financial landscape. The report pointed out that the incumbents are better equipped than fintech firms to meet the emerging need for specialised and holistic expertise. They also have the capabilities and resources to provide more responsive and personalised services. However, digitalisation also means that human wealth advisers have to work as a team and work harder to add value to their services, notes the report. The report says human advisers have to be “24/7, multipurpose advisers”, which means they will have to always be on standby to engage with their clients and provide them with answers within a certain period of time via phone or email. Blockchain, one of the most cited words by players in financial institutions, has also been mentioned in Roubini Thoughtlab’s Wealth and Asset Management 2021: Preparing for Transformative Change report. The report highlights that 45% of its survey respondents are exploring blockchain and 64% expect to expand their use in five years. Blockchain technology is currently being used to explore ways to simplify the task of buying, selling, and transferring an asset. And Tascott saw winners and losers under the technology. From the perspective of asset management firms, the report notes that blockchain technology could be used to help firms streamline their back-office tasks. The report quotes a survey by a British bank, Sandater, in 2015 which projected that “banks alone could be saving up to US$20 billion a year by 2022 just by applying the existing technology”. It also quotes Tapscott as saying that asset management firms should use the technology to reach out to a wider range of investors that they previously lacked the capacity to do so. “They should use blockchain to tap into new markets such as reaching to a wider range of low-wealth investors, or even creating new types of markets,” he says.